If you’re expecting a refund after filing your tax returns but instead receive a letter from the IRS stating that your refund was already issued and deposited, it may be an indication of identity theft. Being a victim of this rising form of crime triggers many negative consequences. The process of correcting the wrongdoing is a lengthy one; according to the IRS an average case takes about 180 days but it can drag much longer if the fraud was undetected for years. The sooner you act the better chances you have of preventing further abuse and restoring your true identity. So, what to do if your tax refund was stolen? 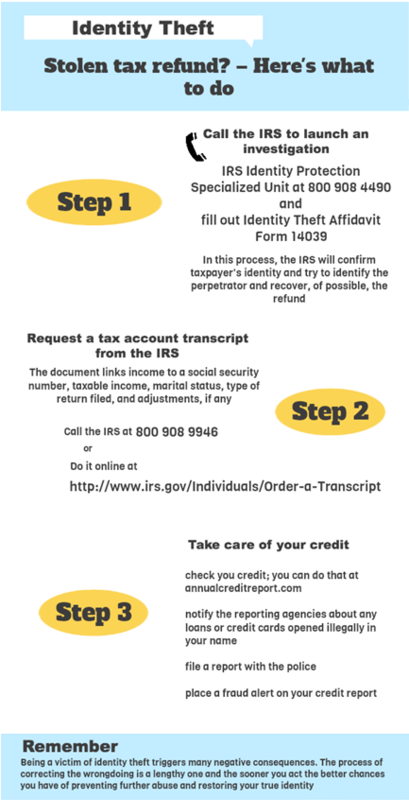 Request a tax account transcript from the IRS. Identity Theft Affidavit Form 14039.